How’s it going, everyone? This is Chris from StrategyBeam, and today we’re going to take a look at how to optimize internal link structure for your site. In a previous video, we looked at how to optimize the SEO content silos and how to structure your content in silos and the importance of that. And this is kind of a continuance on that previous video. So if you haven’t already looked at that, please pause this video and take a look at that. We continue to look at some quick and easy ways to boost your SEO marketing strategy, and internal linking is one of the inexpensive ways you can boost the power of your entire website. We will be looking at how to optimize internal link structure today. Let’s look at what the benefits of internal linking are to maximize our online marketing strategy. There’s quite a few, and these are the top three that stand out. So what this means is that not all pages are equal value to your site, just like not all pages are equal value to your, to your customers or potential customers. This means that internal links allow you to pass power in context from one page onto another, and the pages that have the most value on your on your site. These main pages on your site are called money pages, and we’re going to reference that a couple of times. With internal linking, you can push power and link juice from one page to your money pages, and by doing that it helps those pages stand out in SERPs. Internal linking helps Google and other search engines understand the context of what’s on that page. Internal linking also improves the user experience. Having a page or blog posts that link to other pages or blog posts on your site allows Google and your user. Instead of just having standalone blog posts that don’t link anywhere, you want to have links in that blog posts that go to your money pages, as well as other blog posts to continue that learning experience and the customer journey. Performance metrics or things like time on content, how many pages that people visit, decreasing bounce rate and other metrics that impact how Google understands the power and value of your website in the algorithm. While many people don’t think about these metrics, they do have a significant impact on how Google ranks your site. If you have lower performance metrics like Time On Content, Page Views, a number of pages, and how many sessions people come and returning users. The worse that your site performs in these User Metrics, the lower your pages will rank in SERPs. If you want to power up your SEO marketing strategy, then you need to with controlling the power of pages, improving the user experience, and also improve performance metrics across your site. To help you improve the online presence of your website, we are going to look at specific tactics that you can take to grow your business with internal linking. In the previous video, we looked at how to create silo structures. Internal linking is closely related to those content silos. Let’s take a look at how internal linking and silos work together. The first thing is that internal linking needs to happen within those content silos. And all links need to point into their own silos. In a previous example for the past video, we looked at how to keep parent pages linking to child pages and parent pages only linking to other parent pages. The reason we do this is that content silos keep our content well organized and as a result, it’s easy for Google and our audience to understand that content. Some hard and fast rules that I like to stick to is that child pages should never link outside of their silo. 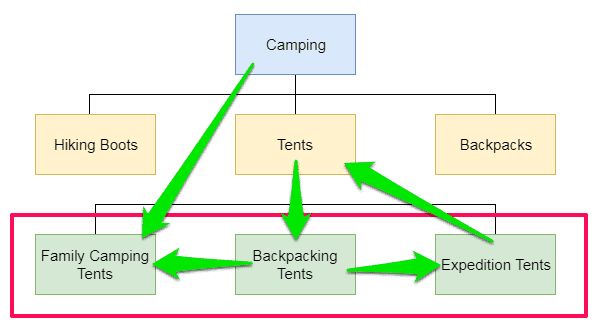 So in a previous example from the last video, we looked at tents, and family tenants would never link to hiking boots or something like that. When it comes to internal linking, you always want to keep everything tight and organized as possible. And in the same rule of thumb, parent pages only parent pages should point to other parent pages, and those pair of pages should point to their own similar or related child pages. We have an up and down vertical movement, as well as horizontal movement with internal link distribution. The only horizontal movement across silos that happens is between parent pages. Looking at your website in terms of vertical and horizontal movement is a key piece to understanding internal linking, so it is important to understand this concept before we continue looking at how your website can boost your SEO marketing strategy. So here’s an example of internal linking and silos working together. We have the same example from the silos video that we, that we looked at last week. The reason that this internal linking structure is beneficial to this example website is that it directs your audience and Google bots horizontally across Parent pages in specific content silos, and then vertically across child pages within specific content silos. This information flow helps keep content within similar silos, while only telling Google that the Parent pages are connected at higher levels. We can have the main category page of camping, pointing to other child pages with intense but tense only the page of tents. The one in the yellow only points down to, backpacking tents, expedition tents, family camping tents, and then within each silo the child pages are only pointing to similar to similar child pages. 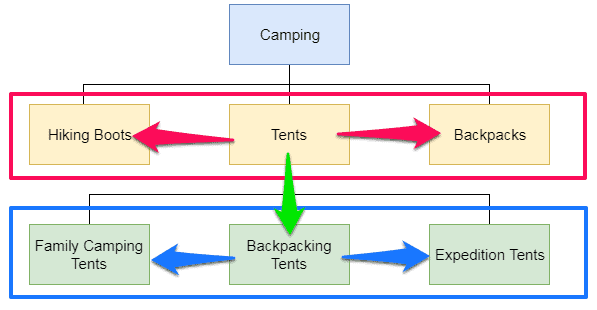 Here we see backpacking tents, pointing expedition tents, pointed a family, camping tents, and vice versa. They can all point to each other, but this is important that we have a strictly linear and horizontal movement of links to keep our link power structure. Now that we have seen what a good internal linking structure looks like, let’s take a look at what bad internal linking looks like. This is a visualization of an example of poor internal linking. In this diagram, we could see that child pages are linking up to category pages/Parent pages that are linking to other pages that are not in their designated content silo. This type of unorganized data structure is difficult for Google to understand what content is going on and also for your audience to understand what’s going on. To ensure that Google bots understand your content and index your pages correctly, you want to structure your website with a logical and tight internal linking structure. Instead of having data connected across different content silos, you want to have a structured linking structure. This is how your site should look if you want to share data to drive conversions through copywriting tactics and boost your SEO marketing strategy. How Do You Optimize Internal Linking For Your Business Website? There are two ways that you could do this. You can either start off fresh if you’re launching your site, which is the easiest and the most efficient way to set up silos and interlinking, or you could do it if you’ve already launched your website. Before we jump into it, I want to say that optimizing internal linking for your site after you create content is challenging. I’ve done that with my site, and it’s expensive and time-consuming and tedious. If you haven’t started your website yet, I recommend that you stop and take a look at this. Optimizing how your content is arranged from the beginning of your website design and content marketing effort is the most efficient approach. Let’s take a look at how you can approach creating a strong internal linking structure before you start creating content. Mapping out your content from the initial planning stages will help you organize your content and improve your overall digital marketing strategy. 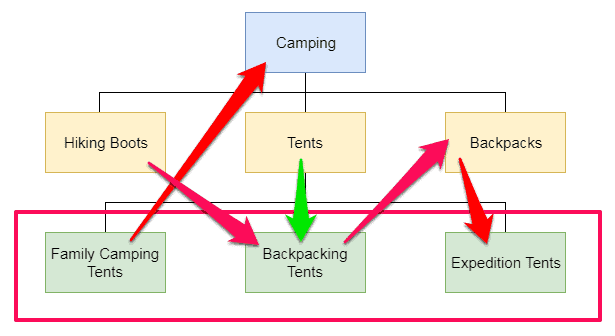 We looked at that with tents, boots, backpacks, jackets, whatever it is, and then a range con range each content by similarities. In our case we had tents and then child pages we marked as being family tents. Expedition tents, backpacking, tents, etc. You would do that for all the different categories and all the separate silos, and then on a spreadsheet, you could just lay out how to interlink child pages and articles. I used Google Sheets to create the map of Parent pages and Child pages prior to creating content. If I’m building out a new website or working on a new silo for content. I start out with three columns, page type, URL, and notes. Then within page type is usually just the parent page and then underneath that, I put a hyphen space and then whatever the child page would be with all the necessary information. 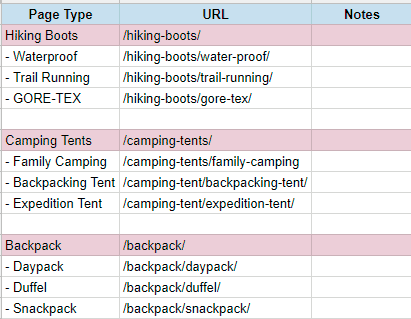 You could see that URL structure is hiking boots, hiking boots, and then waterproof is hiking, hyphen boots, water hyphen proof. You could do that however you want and know that would be where you put the keywords from your comprehensive keyword research or to help out with your user experience. Then underneath that, we have camping tents, and then we broke that out and then also backpack and the backpack, we would break it out in a similar manner. This is the starting point, and you can use different power words to drive more conversions no matter the size or structure of your site. Now you can start to see that only waterproof pages would link to the trail running cortex, whatever else it is that can connect back up to hiking boots. Only hiking boots, the parent page with a link to camping tents or backpacks. If you want to optimize silos with existing content, I can tell you firsthand that this approach is time-consuming and expensive. I had to pay a developer about $400 to implement redirects in the .htaccess file. If you choose to improve the internal linking structure of your site then you will need to conduct a comprehensive SEO audit of your site. You’re going to have to do the same thing that we looked at in the previous slide where you do have to list this out because that’s just kind of a baseline, so you’re going to have to do that anyways. It’s not a big deal if you’ve already started your site, you need to start getting silos and interlinking, but just for your own knowledge and is going to be a little bit of a, an expense and time consumption as well. If you do already have a site and you want to optimize for interlinking and content silos, be prepared to spend about an hour per page. That’s just the general rule of thumb. If you have some people working with you may not take too long, but if you need to optimize your marketing tactics then you should anticipate spending about an hour on each page to implement a solid internal link structure. The first thing you want to do is scrape the site for all of the URLs on your site. This is just to make sure that you don’t leave any 404 redirects or anything like that because you’re going to need to do with these redirect from all of your old pages to your new architecture. Just make sure that everything is scraped and laid out in your spreadsheet and you don’t have any loose ends. Making sure that your website is structured properly can have a dramatic impact on your online rankings, especially if you are looking to optimize content for mobile devices. I always like to assign three primary keywords and to LSI keywords using tools like Keywords Everywhere, SEMrush, Ahrefs, and other tools like that where you could kind of get context for what people are looking for it. Finally, it’s important to add three or one redirects from old pages to the new URLs. Otherwise, Google will have no idea what’s going on. If you are not careful to ensure that all of your links redirect to new pages could have a negative impact on your SEO, and you’re going to be in a worse spot than if you would’ve just left it. 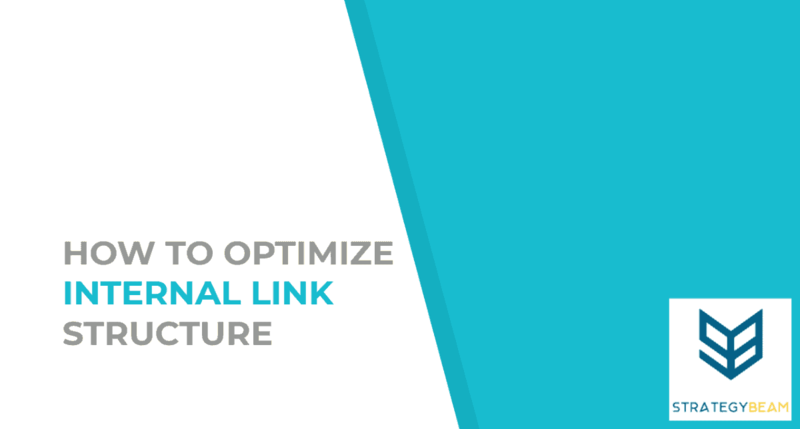 There you have guys we just went over how to optimize internal linking for your SEO marketing strategy and how that relates to content silos. If you liked the video, please leave a comment like and subscribe below. We’d love to hear from you and please share it with your friends because that helps us out. So go on out there and optimize your site and start making some money until we talk to you next time!